Turn that old Corona mill you bought into a quality Stone Flour Mill The regular Corona Mill is fine for grinding course cereal; however, if you desire to grind fine flour and get it the first time through, you need our Genuine Retsel Stone Conversion Kit. The kit includes everything you need to turn your regular Corona into the finest stone hand mill, capable of grinding your grains, like wheat, into the finest, lightest flour you can produce. Think about it – no more running your grain through the mill five times and still ending up with a coarse cereal. This item has a lifetime warranty to the original purchaser. You may purchase the stones only, and use the mill with the original auger, but we recommend that you also purchase the optional Modified Auger. The Modified Auger has been engineered to provide just the right feeding rate for the finer grinding milling stones. Using your old (unmodified) auger will make your mill much harder to turn. We can send the modified auger with this stone kit free of charge if you request it. 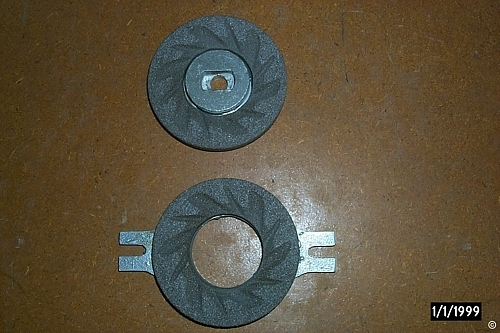 STONE KIT TO FIT CORONA/UNIVERSAL MILL THIS STONE KIT IS A TWO PART KIT THAT FITS MOST CORONA OR UNIVERSAL MILLS. WITH THIS KIT YOU CAN RETROFIT YOUR EXISTING IMPORT GRAIN MILL WHICH ARE AVAILABLE WITH BURRS ONLY WITH RETSEL STONE KIT. NO CHANGES ARE REQUIRED TO BE MADE TO YOUR MILL TO ACCOMODATE THIS KIT. AVAILABLE IN 12 COLORS LISTED ON OUR HOME PAGE. THIS ITEM MAY BE PURCHASED WITH CHECK OR MONEY ORDER ONLY. All our products are made in USA. Due to our strict quality control standards and supplier manufacturing deadlines our delivery time may vary depending on which color and item you select. The standard delivery time on all our products, repairs and special order items is 2 to 8 weeks at this time. Please call us at 208-254-3737 during our regular business hours before placing your order to find our current delivery schedule is at this time.